Do you want to know where to Buy Investment Property? 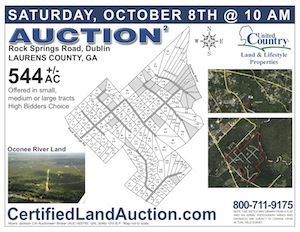 Certified Real Estate Auctions has an opportunity to invest at Land Auction near Dublin, Georgia. Laurens County is a prime rural location and A Top Place to Retire. Escape the chaos and Return to the Country. Myers Jackson a United Country Auctioneer selling land throughout America announces a Georgia Land Auction in A Top Place to Retire that consists of over 500 acres of prime Middle Georgia Property, available for purchase in a variety of sizes large and small. Many buyers want to know – Where to Buy Investment Property? The Real Estate Auction will start at 10:00 AM on October 8th with property previews starting with appointments as early as September 16th. Auctioneers will be standing by ready with the details and giving property tours to qualified perspective buyers that are looking for property in rural parts of the country. Watch the Real Estate Video. “We strive to offer some of the best land available through out rural areas and this 544 acres is no exception,” says Myers Jackson, Auctioneer/Broker in charge of the public land sale. “We are finding that buyers do not always look for the cheapest property, they want to know Where to Buy Investment Property. The best deal with high quality terms and property having prominence with respect to personal needs, can be realized at auction” says Jackson. Invest in something tangible - Land! This land consists of over 20 blocks of land with tracts ranging from 3 acres to well over 100 acres with any registered buyer having the opportunity to pick the tracts or any number of tracts that they choose. The process allows for the high bidders a fair and open process giving them the right to own land knowing they have paid a fair market price. Dublin, Georgia’s central location and nice climate make it A Top Place to Retire. The property is located just 6 miles South of Dublin on Georgia Highway 19 and Rock Springs Road and offers multiple choices on interior paved roads with underground utilities. 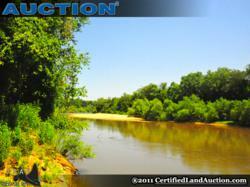 This is a pristine environment to build a life style just steps form the Oconee River. Each tract will have full river access and several lots are direct on the river. Each purchaser will obtain the right to enter the private boat ramp access and enjoy the river at anytime. The perfect home site awaits you just minutes from Dublin and Interstate 16. Another advantage making Dublin a prime place for retirement is the World Class Carl Vincent Veterans Hospital is just minutes away. Additionally, the Fairview Park Hospital a 121 bed facility is located in Dublin, GA.
United Country Auctioneer – Myers Jackson CAI can be contacted at 800-711-9175 or Myers(at)uccre(dot)com additional information about the company can be found at: CertifiedLandauction.com. A dedicated information portal for all documents can be found at CertifiedSaleofLand.com. Photos, Maps, block maps, and area information & vicinity maps can be found online. United Country Auction Services is a division of United Country Real Estate which is the largest fully integrated franchise network of conventional and auction real estate professionals in the United States. Based in Kansas City, Mo., the company has been an innovator in real estate marketing since 1925. United Country supports nearly 675 offices across the U.S. and in Costa Rica with a unique, comprehensive marketing program that includes one of the largest portfolios of property marketing web sites (more than 1,000 separate sites), seven proprietary real estate catalogs with a cumulative distribution of 1.5 million, an extensive, current buyer database and national advertising of properties to more than 90 million potential buyer prospects a week. United Country has been recognized by Dun and Bradstreet’s AllBusiness.com as the Top U.S. real estate franchise, the Wall Street Journal as a Top 1 percent franchise and among Entrepreneur Magazine's Franchise 500® top 100 global franchises.